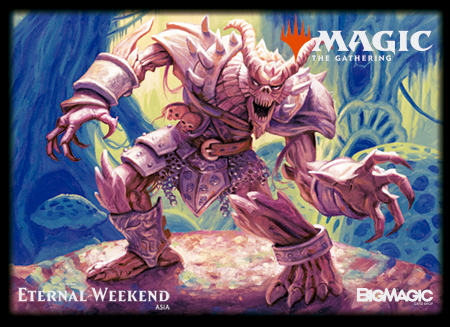 Eternal weekend Asia 2018 is open event for all Magic players. 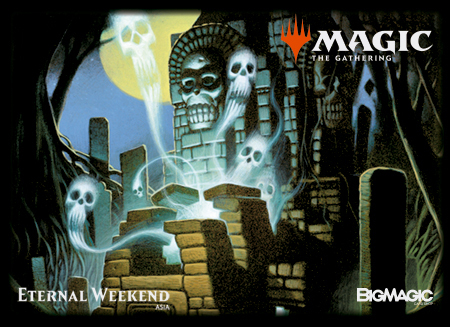 The Tounament Organizer of Eternal weekend Asia 2018 is BIG MAGIC. We can't respond to your inquiries at BIG MAGIC stores. *All times are estimates and subject to change. The winner of ETERNAL WEEKEND Europe 2018 can participate for free. *If you chose payment method with bank transfer/Yuucho transfer, please complete the payment within 1week. *The settlement method will be credit, Paypal. Seat all will be posted. The single-elimination rounds may postpone to the next day. In tournaments where awarded byes are used, each player with a 1-round bye should be counted as 2 players, each player with a 2-round bye should be counted as 4 players, when using the below chart. 128-226 players - 8 rounds. 227-409 players - 9 rounds. Over 410＋ players - 10 rounds. The top8 players of Swiss rounds will advance to single-elimination rounds. Regardless of finish time of the Swiss rounds,the final will be postponed after the Asia Vintage Championship 2018 Swiss rounds finished. The single-elimination rounds decided by best of 3 games. For the first game of each match in the playoff rounds, the player that finished higher in the Swiss rounds chooses either to play first or to draw first. Planeswalker Points multiplier of the event is 4x. Rule Enforcement Level of this event is competitive. 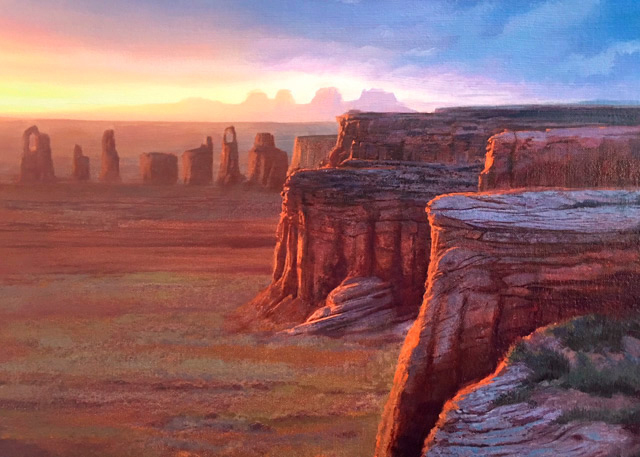 Blank Deck list is here. 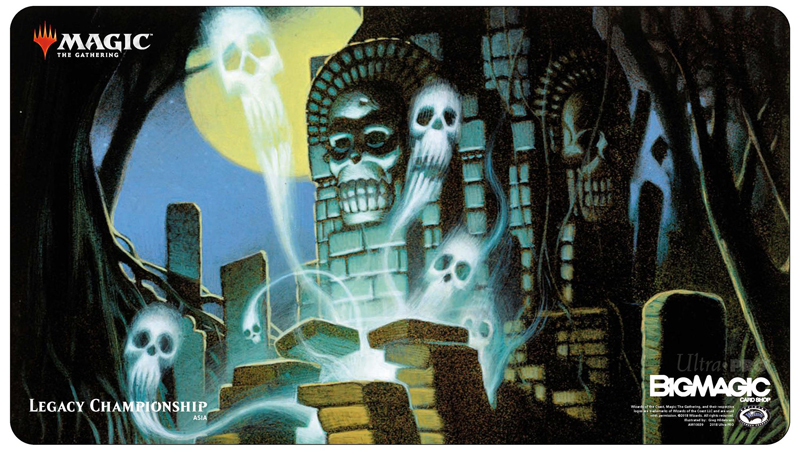 Participation - an exclusive 《Ancient Tomb》 playmat. ・We will assist tickets for airplanes as a travel award to the ETERNAL WEEKEND North America or Card game onlinestore[Bigweb]Store credit 50,000 points. The Swiss Rounds will finish at 19:30-20:00. Whole of the event will finish at 21:00. Standings after the Swiss rounds will be used to determine final order in the standings for The order Position of Semifinalists and quarterfinalists loser will be ranked with decided by Swiss rounds standing. 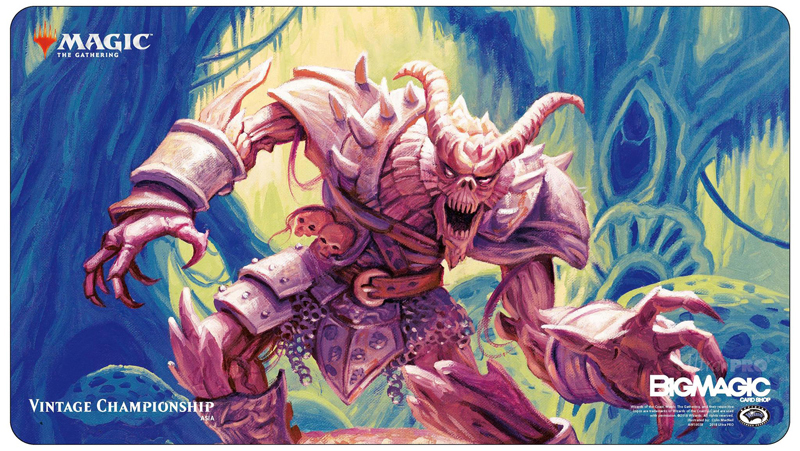 Participation - an exclusive 《Golgari Grave-Troll》 playmat. ※ Cards of COMMANDER (2018 EDITION) scheduled to be released on August 10, 2018 can not be used. The Swiss Rounds will finish at 19:00-20:00. Whole of the event will finish at 22:00. -32 players - 5 rounds. 33-64 players - 6 rounds. 65-128 players - 7 rounds. Standings after the Swiss rounds will be used to determine final order in the standings for The order Position of Ssemifinalists and quarterfinalists loser will be ranked with decided by Swiss rounds standing. The starting life is 30 points. This event is casual,so you get 1 lifetime point. Rule Enforcement Level of this event is casual but Deck list is required. Participation - an exclusive　pack of 《Ancient Tomb》 Sleeves. This event is casual,so players of this event get 1 lifetime point. Winner - Special blank palaymat on illustrated by rk Post and single card that depending number of players. The Swiss Rounds will finish at 19:00-20:30. Whole of the event will finish at 22:30. Participation - an exclusive　pack of 《Golgari Grave-Troll》 Sleeves. and each tournament has trial events. 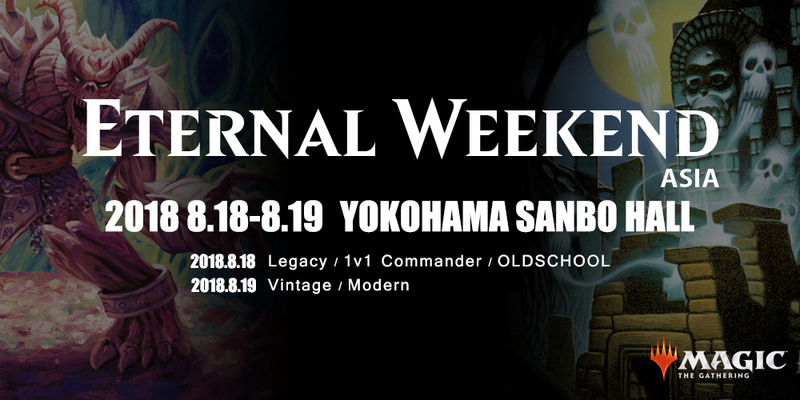 Eternal weekend Asia is WPN premium series. As well as former Grand Prix,it can incorporate Trial events. If a player wins multiple Trials, by"e"s adds up to 2 byes. Byes are only effective to the same format as the main event. 【Area restriction】Holding Eternal Weekend Asia Trial is Asia area only. 【Format】Byes are only effective to the same format as the main event. All 5-0 players receive 1 round bye. If there are no 5-0 players,the player with 1st place at the end of the tournament will receive 1 round bye. Trial events need a L1+ judge as HJ. If the requirement is not satisfied, that event and bye may become invalid. The Trial events require WPN advance level. 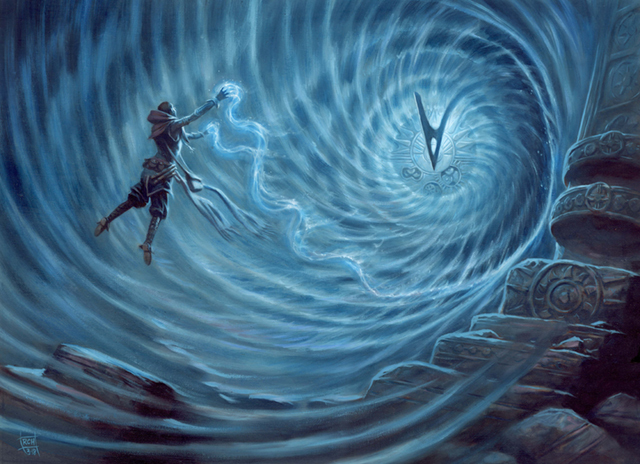 The Trials need acceptation of Wizards of the Coast 2 weeks in advance of the Trial. TO should fill in the following application form 3 weeks in advance of the Trial. The TO and judges of the Trial can not play. ・Altering cards in exchange for money or any type of compensation. ・Taking up excessive space while trading or transporting excessive amounts of trade stock. If it's found ,we will ejection from the venue without refund. If you have any questions about Eternal Weekend trial, please contact here. Please contact Mr. ITO in charge. Please contact BIG MAGIC for inquiries about the venue and events and inquiries about the interview request. *BIG MAGIC Each shop can not answer. During event coverage, there is a chance that GP visitors may have their image published in website photo-coverage or on video coverage via Twitch or NicoNico. By visiting the event, visitors grant us a license for their portrait-usage rights.